Ooh, love the bling. Great Postcard. This looks great and I love that you have taken the blue / green colours you have continued with! I love the way you've added 'imagine'. Gorgeous. Gorgeous PC, love the "pure bliss" stamp/rubon. Wow, those alphas and the bling look great! Lovely postcard, especially the way you did your title. 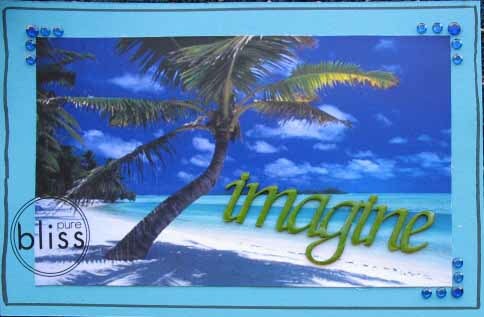 I really like the bling you've used on your postcard- it matches the blue tones in the photo perfectly!